There are lots of ways of working with glass and Fused Glass is just one of many. For example, you might think of Glass Blowing - invented in 1st century BC! It involves blob of hot glass on the end of a pipe, which you blow and magically turns into a wonderful artwork (that's how Crystal glass is made). You can make spectacular pieces but as you can see...not at home! Stained Glass is another well known form, where glass is cut into pieces and then assembled using lead and solder into intricate patterns. It used to be mainly for churches, but is now widely used in homes and in art. Home friendly, but not as much fun! Anyone wanting to try Glass Blowing that should get in touch with the fabulous Ruskin Glass Centre in Stourbridge. We just had a great weekend there at the International Festival of Glass. I don't think he made this fabulous Pumpkin though! Then there is Lampwork or Flamework. Where a torch is used to melt the glass which is then shaped with tools or by blowing. Not home friendly! 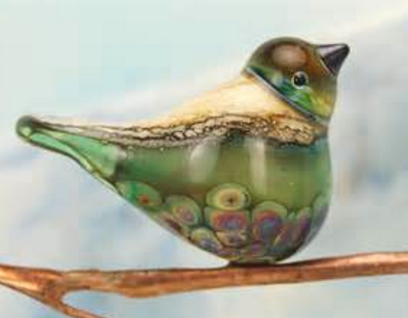 It's most often seen to make lovely glass beads or figurines, like this fantastic little bird. Fused or Kiln Formed glass is older than them all. It involves cutting glass and melting it in a kiln at varying temperatures to get different effects. The main thing to know for fusing is that glass when melted needs to be 6mm. So if you put little bits of 3mm glass in a hot kiln they rise up to be 6mm, if you put layers of glass on top of each other and melt them at a high temperature they spread out to become 6mm. You can also melt at low temperatures which keeps it pretty much as you create it. (But there are many hazards with thick pieces and lots of things to go wrong with all ways of fusing!). What's great is, you can do it at home with a studio in the kitchen and a kiln in the garage - see About Hilary! However, also be aware that fused glass is handmade , so may have bubbles and flaws which you may not see on other forms. This is part of its charm and the excitement and uncertainty of fusing at different temperatues. These little glass ladybirds started out as 3mm glass squares of red and black, which were melted into blobs and then put together again to melt into a whole. Quite fun! ...and then fused, three times as it happened, to melt them totally flat. Others like this dish are fused to keep the textures and reflect the light.